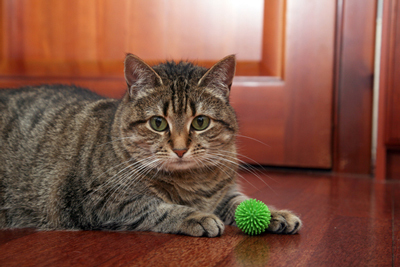 Believe us, your cat won't mind that you've turned a toiletry into a toy. Your cat won't even know, actually. As a former cat-toy shopaholic, I have purchased almost every toy that is known to man and woman for my cat. Furball has had the crinkly balls, the cork balls, the pom poms, the pom pom on a spring, the motorized mouse, the rattling mice, the catnip stuffed in a plethora of shapes, the string toys, and the wands — don’t get me started on the wands. Despite spending hours of my life trying to choose toys that my cat would play with for longer than 30 seconds, there were only three principals that I could count on. 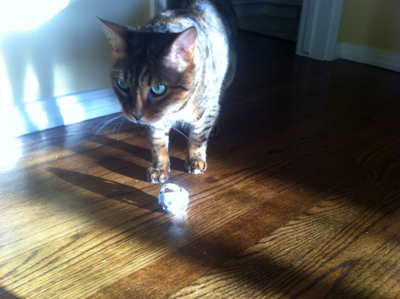 The more expensive the toy, the less likely my cat was to play with it. If the toy came in a package, my cat would like the package better than the toy. You can please some cats most of the time, you can please all of the cats NEVER, and if you’re really lucky, you can please YOUR cat once in a blue moon. What enabled me to finally kick my cat-toy shopping habit was making my own toys from stuff around the house. One of my favorite things to up-cycle is the humble toilet paper roll. Here are four simple toys you can make in seconds from a toilet paper roll. Give your cat a toilet paper roll. What? Were you expecting something more complicated? Remember, cats are captivated by the simplest things. Your cat might LOVE wrestling with a toilet paper roll, and your wallet and the environment will love you for turning trash into treasure. You can make fun rings for your cat to catch. Begin by pressing the toilet paper roll flat. Then cut the flattened roll into rings a quarter-inch to a half-inch thick. You should be able to make 10 to 12 rings per roll, depending on the width of each ring. Pop a flattened ring open and you’re ready to play. Toss the ring in the air or whip it across the floor and watch your cat give chase. 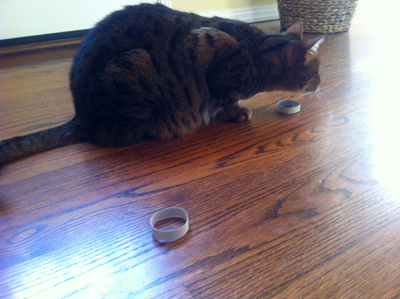 To spice things up a bit, try cutting the rings thicker or thinner to see which your cat prefers. Believe it or not, you can transmogrify a tube shape into a ball. First, you’ll need to cut rings about a quarter-inch thick (as described in the Ring Toss toy above). Place one ring flat on the table. Then stand another ring inside it. Pull the ring on the table up around the standing ring until it reaches the middle of the ring. It will look like the standing ring is wearing a belt. Continue wrapping rings around the first two rings at different angles until you form a ball. The ball will come apart with play, but it’s fast and simple to put it back together. And when it does fall apart, you can start a new game with the rings. Cut a straight line two inches long at the end of a toilet paper roll. Continue cutting parallel lines about a third of an inch apart all the way around the roll. Next, press the toilet paper roll until it is completely flat. Fold it in half lengthwise, press firmly, and then fold and press again. When you’re done, spread out the "bristles" at the end of the roll. 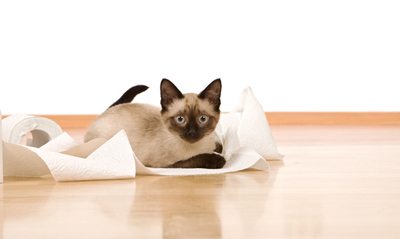 When you sweep your toilet paper broom along the floor, cats can’t resist the rustling sound it makes. 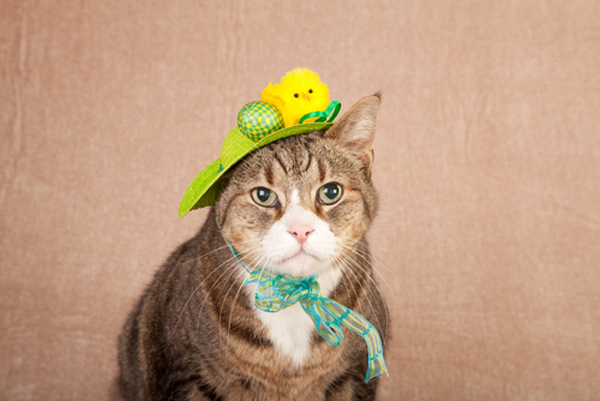 Simply toss the broom in the air for your cat to catch and watch the fun begin. Do you have any ideas for cheap toys like these? Let us know in the comments!